So, after I put Natalie down for her nap I usually go downstairs to do my WiiFit run. I run for ten minutes in place while gripping onto the WiiFit remote. I usually put on a television program and hope that it will distract me from the pain. Yesterday I put on The Real World. I thought all the drama between the boys and the girls would cause me to forget that I couldn't breathe properly. I mean, ew, the boys put a rat in one of the girl roommates bed. But all I could think about was my thighs, my thighs, oh dear God my THIGHS ARE BURNING! Another time I put on Jon and Kate Plus 8 and I only found myself annoyed when they mentioned their (free) washer and dryer sets at least a dozen times. "I love my Whirlpool," Kate kept saying. Yesterday I went to do my run. And usually the WiiFit comes on and this is when it'll tell you off if you skipped a day of working out. Sometimes it asks me if I'm having a nice day. Sometimes I am not having a nice day. So I start to explain that even though it's only one thirty in the afternoon, that I've already had to unclog the toilet because Natalie is like a superhuman baby who can easily lift off the toilet locks and then she finds it hilarious to stuff the bowl full of toilet paper. Then I remember that the WiiFit isn't real and I quickly shut my mouth. But yeah, the WiiFit admonished me because I hadn't worked out the day before and then it asked me where my husband was. A long time ago, Tom decided that he'd work out on the WiiFit. He did it for a week straight and then, I don't know, stopped. I have no idea why Tom named his character Saint. I think he likes to pretend he's some buff guy on a Clint Eastwood movie. Really, I just wanted to get started on my run. Because the sooner I start to run, the sooner that it's over. There is no back button. You HAVE to answer. I imagine if there were a back button and had I had pushed it, I'd have gotten a long lecture from the WiiFit. How dare you ignore my question! Shame on you! I'm submitting your data to Jillian Michaels from The Biggest Loser and she's gonna march inside your house and throw away all your Little Debbie cakes! NO! Not my Little Debbie cakes! Fine. I'll answer your stupid question! So I just put that Tom looked the same. Because he does to me. I mean, he can still fit into his clothes so he hasn't gained weight. His pants haven't been falling off so he hasn't lost weight. Sorry Tom, but you aren't more toned. I know this because I share a bed with you. I thought that would be the end of it. I thought that the WiiFit would be all, "Ahh, okay, he looks the same so we can move on." No, change is not always exciting. I mean, I nearly passed out when I saw that Lucky Charms were nearly four bucks a box. Last week they had been down to $1.99. That is NOT good change. So, I thought THAT was the end of it. 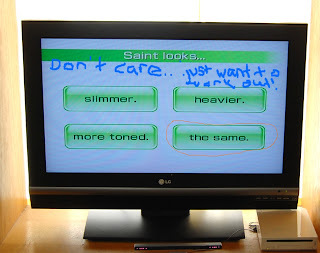 The WiiFit had given me a lecture, even though it's not my fault that Tom isn't working out. I mean, am I his mother? No. So leave me alone, EvilFit! So not only do I have Tom whining that I don't pay enough attention to him, but I also have my electronic devices telling me the same thing. 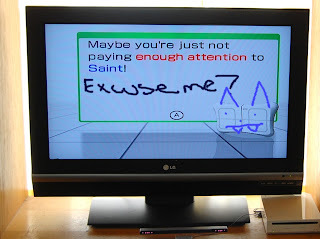 Let me tell you, WiiFit, that even if I paid all the attention in the world to Tom, that he still would not get on you. Sorry. I hate to be blunt but it's true. My husband, while he's a wonderful man, can be a bit lazy. I mean, if he can't put his socks in the laundry basket when the laundry basket is less than two feet away, I don't think he's going to take the time to work out. I'm just saying. So, yeah, I pushed A and hope that that is the end of it. Because I just want to DO MY FREAKING RUN! Does the WiiFit not realize that I only have exactly an hour and a half to work out, do the dishes, scrub the counters and vacuum before Natalie wakes back up? Doesn't it comprehend that I'm on LIMITED TIME? It does not comprehend that. And then, to boot, it compared my husband to a dog. Which, okay, I've done before. When he deserves it. I mean, sometimes he acts like one. But then it basically repeated that I needed to pay more attention to Tom. To the point where I began to grow suspicious. Tom? 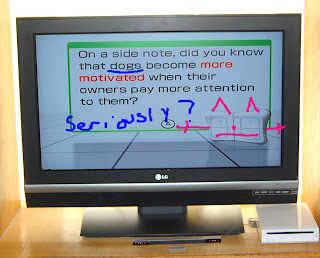 Did you somehow make the WiiFit do this? But then I remembered that the man barely knows how to change a tire and relaxed. It was simply the WiiFit being...well, the WiiFit. I was almost surprised when the WiiFit let me go work out after that. I expected page after page on how I needed to get Tom back to working out. When Tom came home I said, "Get on the WiiFit." He looked confused. "Huh? Is this some new sexual thing?" I swatted his arm. "No! It asked me where you were and then..compared you to a DOG." 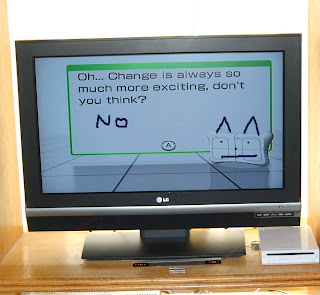 Tom ended up getting on the WiiFit. It turns out he's lost two pounds so the WiiFit didn't give him that much of a hard time. Sometimes, I really am tempted to hurl that WiiFit out the window. But then, I imagine, it'll find some way to lecture me. Please tell me that my WiiFit isn't the only one that seems to be injected with a little bit of Satan. nope mine is the spawn of satan. i plan on blogging about him later this week lol. he said ow when i got on last week and made my mii blow up. i thought dh was going to fall off the couch laughing at me. i hate that thing~! This has me laughing so hard!! oh my god...i was considering getting one of those, but not after that blog entry! haha that is hilarious though! Just stopping by from SITs to say hi! Great post!